Landon: I'm sorry she never got her miracle. Landon: Jamie saved my life. She taught me everything about life, hope, and the long journey ahead. I'll always miss her. But her love is like the wind, I can't see it. But I can feel it. My favourite quotes - "Find out who you are and do it on purpose. ", "Her love is like the wind, I can't see it. But I can feel it. ", & "Love is always patient and kind. It is never jealous. Love is never boastful nor conceited. It is never rude or selfish. It does not take offense and is not resentful. Love takes no pleasure in other people's sins, but delights in the truth. It is always ready to excuse, to trust, to hope, and to endure whatever comes." Did You Know? - A Walk To Remember is the second Nicholas Sparks book to be adapted into a film. The first of his books to be adapted was Message In A Bottle in 1999. After A Walk To Remember, the following films were made - The Notebook (2004), Nights In Rodanthe (2008), Dear John (2010), The Last Song (2010), The Lucky One (2012), and Safe Haven (2013). Although Message In A Bottle was the first film adaptation, the book The Notebook was published first. A Walk To Remember was singer Mandy Moore's first feature film in a lead role. But it wasn't her film debut, her first foray into acting was in The Princess Diaries. And it was Anne Hathaway's film debut too. I already noticed Mandy Moore after her wonderful performance in The Princess Diaries, but that was just a minor role. So I wanted to see if she would impress me in A Walk To Remember and prove that she can act as well as she can sing. And that she did. Yes. A Walk To Remember is a romantic drama, which is right up my alley. But I love it because it's about it's not just about two people falling in love. It's also about self discovery and faith. Jamie: Please don't pretend like you know me. Landon: But I do. I do. We have all the same classes and same schools since kindergarten. Why you're Jamie Sullivan. You sit at lunch table 7, which isn't exactly the reject table but its definitely in the self exile territory. You have exactly one sweater. You like to look at your feet when you walk. Oh wait and yeah, and for fun you like to tutor on the weekends and hang out with the cool kids from the Stars and Planets. Now how does that sound? Jamie: Fairly predictable. Nothing I haven't heard before. Landon: You don't care what people think about you? I remember in Secondary School, I was part of a group of 5 girls. We were really close and we went everywhere together and did everything together. I wasn't the "leader" of the group and we weren't wild or bullies of the school or anything, but we didn't let anyone else in the group as well. But that didn't last very long. It's a little fuzzy to me now, but I think this is what went down. One time I got into a disagreement with one of the group members just before lunch break, and to make life easier on the other 3 in the group, I decided to eat lunch on my own without them. Instead of eating alone, I befriended a girl from my class who always alone and had lunch with her. We started chatting and I got to know her a little better. But after lunch, when I approached my friends, all 4 of them declared that I was no longer part of the group because I had betrayed them. Apparently I had made friends with someone the "leader" didn't like and while the others didn't agree with her verdict, they went along with it because of peer pressure. Well, suffice to say we stopped being friends after that. Looking back at it now, it's all pretty silly and childish, but quite hilarious. Do you care what people think about you? I do. Sometimes I feel that I care about what others think too much. I love the fact that Jamie doesn't care how others view her. She has her beliefs and sticks by them. That takes a lot of guts, especially in high school. I like that it didn't matter to her to be in the "in" crowd. Maybe the character of Jamie Sullivan is too perfect. And maybe some people will have a problem with that. But to me, it was because she was so good and perfect that her death hits you the hardest. Landon: 42? What do you mean 42? Jamie: 42 is befriend somebody I don't like. It's a to-do list I have except for my life. Landon: What like getting a new personality? Jamie: Be in two places at once, get a tattoo. Jamie: I'd tell you but then I'd have to kill you. Lists. Do you have a to-do list for your life? I believe they call it a bucket list. I don't have one, but whenever I watch this film, I am very tempted to make one. I guess if you know you're about to die, you'll start making lists as well. But really, why should we make a list only when we're close to death? Shouldn't we all make plans and work hard to achieve everything we want to achieve even if we're not dying soon? Shouldn't we all live life to the fullest every day of our lives? Once again I find myself thinking, "Maybe I should start having a list of things I want to do and achieve before I die". Quit thinking, just do it. Life is short. If you don't make the most of it, it is nobody's fault but yours. Landon: Number 1 on my list is getting out of Beaufort. Jamie: Um... I don't think getting out is gonna be your problem. It's more like figuring out what you're going to do when you get somewhere. Landon: What do you mean? Jamie: I mean you can do anything. Now comes the hard part. So you've decided you want to make a bucket list. But before you can do that, you need to figure out what you want to put on that list. Gosh! That seems like a tall order. Does it make sense to put something on the list that is seemingly impossible? Like the way Jamie put "Be in two places at once" as one of the things she wants to do. Cos I want to put live in an underwater colony and I want to live in space but that is highly improbable. Have you gotten it all figured out? What you want to do with your life? Who do you want to be? What do you want to achieve? I have a better idea of what I want now than I did at 18. But I'm definitely still figuring it out as I go along. And that what I really like about this film. This film makes you ask yourself - what do you want out of your life? Maybe all we need is someone like Jamie Sullivan in our lives. To constantly remind us life is short and precious. And that you can do anything. Landon's Mother: Were you with Jamie? Landon be careful, she's the Reverend's daughter please. Landon: Mum. It's different with her okay. Landon's Mother: It's different with her? Landon's Mother: It better be different. I was doing laundry the other day and I found this. Examine a moon rock. Go to college. Get into medical school. Honey, these are really beautiful ambitions... they're... but you're gonna have to work really hard. Landon: I can do that. Landon's Mother: Yeah, you can. Landon: Mum I... Jamie has faith in me you know. She makes me want to be different. Better. Which brings us to the part about love and finding that special someone who has faith in you and believes in you. Someone who makes you want to be different... better. I always believe that your special someone is one who would make you a better person. And that is what happens to Landon in A Walk To Remember. I haven't met such a person I yet. But when I do, I hope he can be by my side for as long as possible. There's a Chinese saying: 不在乎天长地久, 只在乎曾经拥有 which translates to mean "It doesn't matter if we can't be together forever, it's good enough that we once had each other". And some people want their happily ever after, forever, and think this saying is hogwash. What do you think? I mean, of course every HOPES that their love will last forever, but if you are separated by death, like Landon and Jamie? Can you be satisfied with just the memory of the wonderful love you had and be thankful that you had it at all? At the moment I prefer to have forever, but IF I ever face a situation like this, I'll let you know if I changed my mind about where I stand on this. A Walk To Remember is singer Mandy Moore's first lead role in a feature film and I feel that she did a pretty decent job. I think that her performance as Jamie in the film is one of the best in comparison to her other films. The other films she acted in that I really enjoyed was Saved! and Because I Said So. I remember Shane West from another film that I quite like called Get Over It. I can't really remember which film I saw him in first, but I think he held his own in A Walk To Remember as the bad-boy-turned-good Landon Carter. For A Walk To Remember to do well, it being a romantic drama and all, the two leads had to have the right chemistry and to be able to deliver the emotions required for their roles. Considering the fact that these two leads aren't very experienced, I was pretty impressed by their performances. 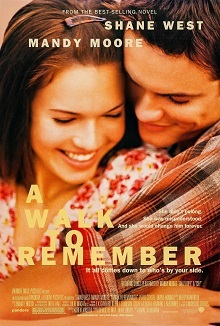 A Walk To Remember is an adaptation of the Nicholas Sparks book of the same name. And the soon-to-be-released film Safe Haven is also adapted from one of Nichlas Sparks' books. There are a total of 7 Nicholas Sparks books that have been adapted into a film. That is really quite a feat. Although authors like Danielle Steel have had their books adapted into films as well, films adapted from her books almost never feature big named stars. I will attempt to take a look at all 7 films and to share my thoughts about them. Of the 3 films that I've watched, A Walk To Remember remains my favourite. (1) Adam Shankman has directed films like The Wedding Planner (2001), Bringing Down The House (2003), The Pacifier (2005), Cheaper By The Dozen 2 (2005), Hairspray (2007), Bedtime Stories (2008), and Rock Of Ages (2012). He was also the choreographer for films like The Flintstones (1994), Casper (1995), George Of The Jungle (1997), A Life Less Ordinary (1997), She's All That (1999), Blast From The Past (1999), Forces Of Nature (1999), Inspector Gadget (1999), Deuce Bigalow: Male Gigolo (1999), Catch Me If You Can (2002), Step Up (2006), Step Up 2: The Streets (2008). (2) Singer-songwriter Mandy Moore has acted in films like The Princess Diaries (2001), How To Deal (2003), Chasing Liberty (2004), Saved! (2004), American Dreamz (2006), Because I Said So (2007), License To Wed (2007), and Dedication (2007). She has also voiced the character of Sandy in the live action film Racing Stripes (2005) and Rapunzel in the Disney animation Tangled (2010). (3) Shane West is known for playing Eli Sammler in the television series Once And Again, as Dr Ray Barnett in the television series ER, and as Michael in the series Nikita. He has also guest starred in television series like Picket Fences, Boy Meets World, The Closer, Buffy The Vampire Slayer, and Sliders. He has also acted in films like Get Over It (2001) and The League Of Extraordinary Gentlemen (2003). (4) Daryl Hannah has acted in films like Blade Runner (1982), Splash (1984), Wall Street (1987), Steel Magnolias (1989), Memoirs Of An Invisible Man (1992), The Little Rascals (1994), Kill Bill, Volume 1 (2003), Kill Bill, Volume 2 (2004), and Eldorado (2012). (5) Lauren German plays Leslie Shay in the television series Chicago Fire (2012-present) and played Lori Weston in the television series Hawaii Five-0 (2011-2012). She also guest starred in television series like 7th Heaven and Human Target.